224 pages | 6 B/W Illus. The impacts of climate change are already being felt. Learning how to live with these impacts is a priority for human development. In this context, it is too easy to see adaptation as a narrowly defensive task – protecting core assets or functions from the risks of climate change. A more profound engagement, which sees climate change risks as a product and driver of social as well as natural systems, and their interaction, is called for. Adaptation to Climate Change argues that, without care, adaptive actions can deny the deeper political and cultural roots that call for significant change in social and political relations if human vulnerability to climate change associated risk is to be reduced. This book presents a framework for making sense of the range of choices facing humanity, structured around resilience (stability), transition (incremental social change and the exercising of existing rights) and transformation (new rights claims and changes in political regimes). The resilience-transition-transformation framework is supported by three detailed case study chapters. These also illustrate the diversity of contexts where adaption is unfolding, from organizations to urban governance and the national polity. 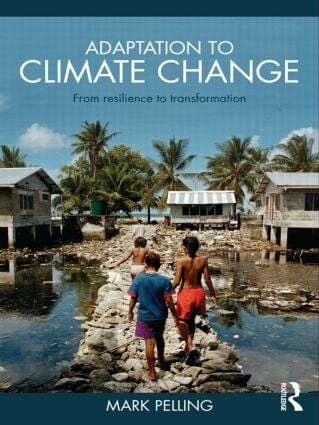 This text is the first comprehensive analysis of the social dimensions to climate change adaptation. Clearly written in an engaging style, it provides detailed theoretical and empirical chapters and serves as an invaluable reference for undergraduate and postgraduate students interested in climate change, geography and development studies. Mark Pelling is Reader in Geography at King’s College London and before this at the University of Liverpool and University of Guyana. His research and teaching focus on human vulnerability and adaptation to natural hazards and climate change. He has served as a lead author with the IPCC and as a consultant for UNDP, DFID and UN-HABITAT.